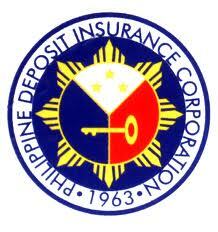 The Philippine Deposit Insurance Corporation or PDIC will be conducting a sealed bidding of Php80.3-Million worth of real estate assets on December 20, 2012, 9:00am, at the 9th Floor PDIC Training Room, SSS Building, V. A. Rufino Street corner Ayala Avenue, Makati City, Philippines. The deadline for the submission of sealed bids will be at 2:00 pm on the same day. Bids will only be accepted from direct buyers. More details below. Foreclosed properties and acquired assets from PDIC and closed banks are included in the bidding, and are from Metro Manila, Luzon, Visayas, and Mindanao areas. All properties are for sale on an “AS-IS, WHERE IS” basis, and buyers are advised to conduct their own due diligence, prior to submitting any sealed bids. All bidders are required to include in their sealed bids a 10% bid bond in the form of cash or manager’s check. For winning bidders, the balance of the winning bids must be paid on or before January 4, 2013. 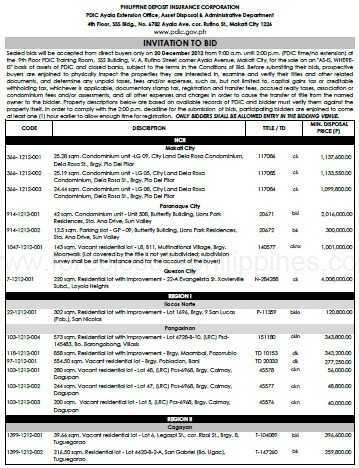 To download the complete list of PDIC foreclosed properties for sealed bidding on December 20, 2012, just click on the image preview below. The list consists of 8 pages and is in PDF format. Alternately, you may click on the following link to download the list. *Other relevant forms and pictures of the properties (when available) can also be found in the official website of the PDIC. To our success and financial freedom! Text by Jay Castillo and Cherry Castillo. Copyright © 2008 – 2012 All rights reserved. Full disclosure: Nothing to disclose. FREE CHECKLIST: IDENTIFY AND AVOID PROBLEMATIC FORECLOSED PROPERTIES BY DOING PROPER DUE DILIGENCE! Avoid losing money, wasted time and effort caused by buying foreclosed properties that have too many problems, with our free 60-item Property Due Diligence Checklist. Grab your free copy now. Subscribe now and get email updates with new public auction schedules, foreclosed property listings, real estate investing tips, trainings, and news. It’s free! A lot of people encounter problems and challenges when buying foreclosed properties. I encountered a lot of challenges myself. But thanks to patience and a lot of help from mentors and friends, I was able to overcome those challenges. I started this blog in 2008 to share lessons learned and how to overcome common challenges people face with real estate investing in the Philippines.